September to December of 2018 yielded promising results for multifamily properties. This quarter showed that among all the tenant background checks processed, an average of 20.18% produced a criminal record. On the flip-side, this means that 70.82% of the rental applicants scanned did not have a criminal record in their background checks. Quarterly, an average of 5.91% of all rental applicants possessed an eviction record, with an average of 8.7% producing an enhanced ‘eviction+’ record. What’s the difference between a nationwide eviction scan and an enhanced eviction+ scan? Overall, the eviction record search looks for public record data on your rental applicant’s file within a proprietary database of 36+ million records built by CIC. This nationwide scan includes looking into past court actions, unlawful detainers, monetary judgments and court-ordered possessions. Eviction+ pairs CIC’s national eviction search with a more enhanced address history search. A nationwide database scan of all 50 states + D.C., including all major, reportable types of criminal records. A nationwide search of a proprietary database of 36+ million reportable unlawful detainer (eviction) records, no duplicates. An enhanced version of the nationwide eviction database scan that cross references applicants with additional addresses associated with their consumer profile. Alongside new rental housing criminal and eviction data, this quarter’s FICO credit scoring data revealed mixed results. For the good news – on average, 37.6% of all rental applicants scored this quarter had an excellent or good credit score, with FICO scores between 701 – 850. For the not-so-great news – an average of 34.55% of the applicants scored had a poor or very poor credit score, with FICO scores ranging between 300 – 640. If your rental properties are encountering more low credit scores than high ones, it might be a good idea to add a policy targeting lower scores to your rental criteria that considers additional rental factors. These can be your property’s location, your rental competition, and even weighing the applicant’s criminal and eviction history. 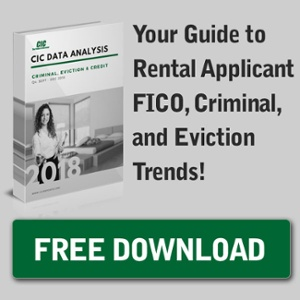 As new rental applicant eviction, criminal and credit scoring background check data gets released, keep this in mind when you revise your property’s rental criteria. Click here to subscribe for future updates.